Posted by Dave Emory ⋅ May 2, 2017Post a comment Email This Post Print This Post Tweet This! Poster printed up by Robert Surrey, Leahart’s American Nazi Party associate in Dallas and personal secretary to Edwin Walker. COMMENT: Numerous programs and articles on this website have dealt with Nazi involvement with the assassination of JFK, from paramilitary American Nazi elements to individuals and institutions overlapping the Reinhard Gehlen spy milieu. 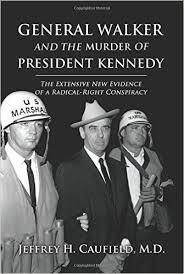 In the most recent Food For Thought posts, we excerpted a recent, massive volume General Walker and the Murder of President Kennedy by Jeffrey H. Caufield M.D. NB: For a seasoned researcher, this is a useful and important book, however it MUST be handicapped–the author is dismissive of the [by now recorded fact] that elements of the intelligence community were involved in the killing. Of course, they were. In FTR #188, we detailed the “Hate Bus,” a gambit by American Nazi Party leader George Lincoln Rockwell to protest the Freedom Riders and the Civil Rights movement. General Walker and the Murder of President Kennedy by Jeffrey H. Caufield, M.D. ; Moreland Press [HC]; Copyright 2015 Jeffrey H. Caufield; ISBN-13: 978-0-9915637-0-8; pp. 79-82.
. . . . No FBI documents, other than the New Orleans police mug shots from the Hate Bus arrest, were in the FBI record raises the question of what happened to FBI reference 841767D (Leahart’s arrest record in the Hate Bus incident) and why it did not accompany the allegation and substantial likelihood of an Oswald-Leahart association when sent to the Warren Commission. Banister’s close friendship with New Orleans FBI SAC Regis Kennedy may have had something to do with the critical omission.